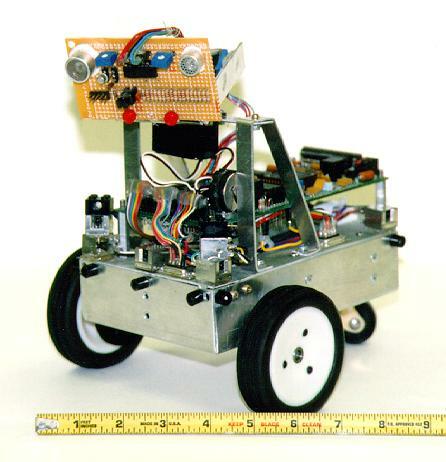 Thomas is a fully autonomous mobile robot constructed for the Machine Intelligence Lab at the University of Florida. C) Controller -- Motorola 68HC11E9 Micro-controller with RAM upgraded to 64k battery backed up static ram, and memory mapped I/O. D) Sensors -- 7 modified Sharp IR sensors for object detection from 0 - 24 inches. 2 IR emitter/detector pairs used as wheel encoders for distance traveled measurements 1 40kHz sonar emitter/detector mounted on a pan/tilt servo head for time of flight distance measurements from 2 - 8 feet. E) Power -- Power is supplied by two AA 8 packs nicads which provide approximately 10Vdc which is then regulated down to 5Vdc. F) Programming -- Originally programmed in 6811 assembly, Thomas is also capable of being programmed in IC11.